In my house at Christmas, manicotti might be as popular as Santa Claus. It's a fancy centerpiece dish that is that rare combination of being impressive and pretty simple. I know you may look at this recipe and think - that's a lot of stuff BUT it's the holidays - why not make something super fly? To me - that means OLIVES! People who know me know I am a slave to olives. I love them all and try to work them in every meal. I like olives in my tofu scramble just as much as I love them in a salad, tossed with pasta or in a taco. Really is there anything an olive can't do? 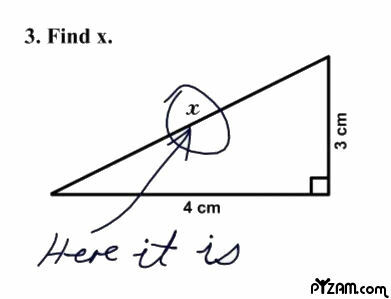 Maybe geometry. Olives seem bad at math. I came up with this Kalamata Olive Pesto a few years ago to mix in with linguine and some broccoli but after trying it out in manicotti a few years after that - I can't imagine ever going back to the standard vegan tofu ricotta style ever again. I'd miss those olives but I know not everyone likes things as fancy pants as me so I included a standard no pesto tofu ricotta recipe too... because it's the season of giving and I love showing all the things you can do with Tofu! I had a hard time choosing which photo I liked so - ya know - here's another one. Put all the Sauce ingredients in a large pot and heat at a medium heat. Stir periodically. Choose which Filling you would like from the 2 listed above and then put each ingredient in a food processor or blender (one at a time) and blend them till they are a paste. Don't worry about wiping out the machine after each ingredient - you'll be mixing them anyways. Put all the processed ingredients in a large bowl and mix with a large spoon until blended. If you have a pastry bag set or decorating gun, fill that with the Tofu filling and set it up with the largest tip. Spray a lasagna dish with Olive Oil Cooking Spray. Take your cooked Manicotti Tubes and fill with the Filling - either with your pastry bag, decorating gun or just use a spoon and be gentle. After you fill each one place it in the lasagna dish. You should end up with just the right amount of Filling to fill the Manicotti Tubes. Pour 2 ladles of the Sauce over the top and sprinkle the Daiya and Vegan Parmesan Cheese. Bake for 20-25 minutes. You'll know it's done when the Daiya is melted and the Sauce is bubbly. Sprinkle Red Pepper Flake and Dried Oregano and more Sauce if you'd like over the top when you serve.We put at least another ladle of sauce on each plate. I share your love of olives and can't wait to try this olive ricotta in my next lasagne!! 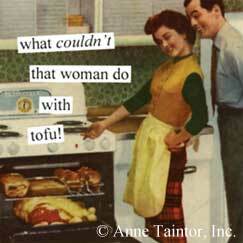 I make a pretty mean tofu ricotta myself, but this just sounds spectacular! this looks great! i think you love braggs as much as you love olives, no? We always have pasta at Christmas too...usually lasagne or ravioli. 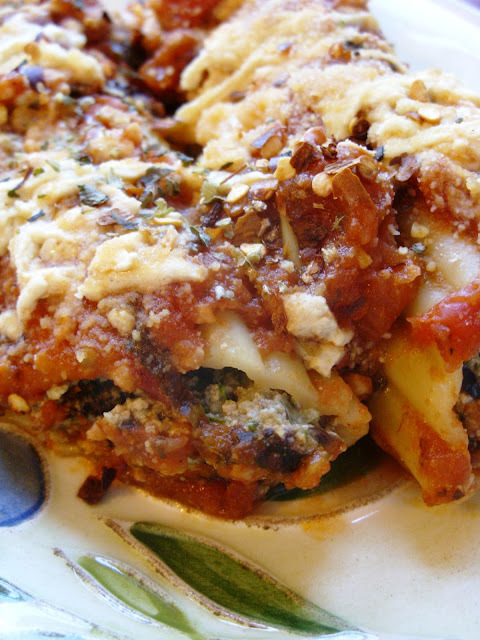 These manicotti look super duper delicious! 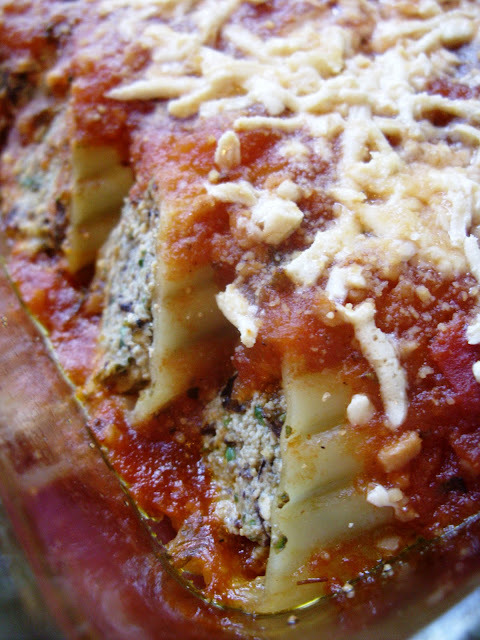 manicotti looks fantastic! 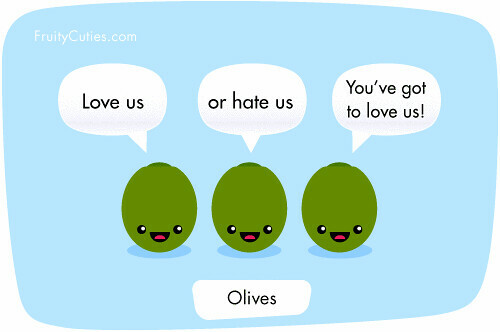 i agree, olives make everything better!